This week on Monday Comic Corner, we have another Magical Game Time comic, of course by the amazing Zac Gorman. By now you should all be familiar with his style, and this week’s untitled comic about paths is simple, yet enjoyable. Though, like many of his comics, few words are stated, the message is clear, and the fantastic artwork is what takes the reader on his or her journey. It’s almost as if adding more words would detract from the relaxed mood of this comic. Hit the jump for this week’s adventure! I don’t think I’ve ever been more relaxed by reading a comic. The lack of textual focus made me reconsider the first panels, which I honestly skipped over in my first read. 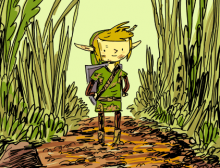 And this left me considering other ideas that this comic expresses, and thinking about how maybe Zac’s comics don’t just use Zelda as a medium through which to convey a message, but also as a way to explore the “what-if’s” of the series. 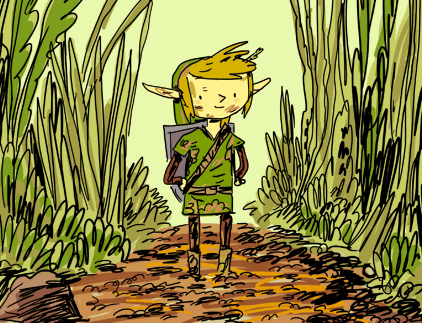 Sometimes I wonder whether Zelda need a little bit of an exploration reboot. In more recent Zelda games, I find myself more and more worried with completing the task and finishing the story, and less focused on enjoying the details of the adventure environment. The ability to choose your own route through the game feels restricted, and there simply isn’t the option of choosing between an easier or more enjoyable path. What did you think? Let us know in the comments!